The Star is the tarot card that would always make me sigh with relief or wash me in calm when I drew it. “Oh, good,” I’d think. “Good.” As though this card made whatever I was analyzing okay. Why could The Star make even a dreadful situation seem okay? It offered tomorrow, and the possibility of a better day. Even if it’s only a minute speck of light in the great expanse of darkness that surrounds us during our bleakest hours, it’s that light that we see, that tiny flicker that we cling to. Not the darkness. The darkness disappears, and the night is filled with a glimmer of hope. That whisper can push us into our dreams, give us exactly what we need when our strength is exhausted. Just as the sun’s transit through Aquarius heralded rain and the promise of new life come Spring, The Star pours life-giving water into rivers of thought perhaps run dry by too much talk and over-analysis. Enough already. Take what you know now and make the leap. It sometimes takes a Fool’s knowing to make that leap from the edge, to trust implicitly in what The Star holds before us. It takes a fool to follow the longings of a youthful, and as yet unbroken heart without heed to what others have come to know, without the hardness of the callouses they have formed through their journeys. It takes a fool to venture out on our own into the vast darkness with our eye held steady on one tiny, flickering bit of hope that can give us wings to soar above the abyss. This beautiful video is set to Medwyn Goodall’s Palace of Dreams from Where Angels Tread. It’s a lovely, relaxing meditation for The Star ~ not as the tarot card, although it is filled with stars ~ but as Aquarius’ vision born, filled with the breath of life. Dim the lights, and watch in full screen mode. The animated Star is by GeminiMoon. 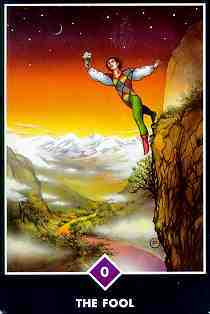 The Fool card is from the Osho Zen Tarot.